Remembering Antigonish County's "Vimy Boys"
1. 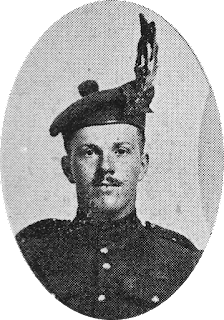 Private Wendell Alexander MacHattie, son of Alexander John and Janet (Hattie) MacHattie, South River Lake, Antigonish County, was killed in action on April 9, 1917, during the 42nd Battalion’s assault on the sector of Vimy Ridge adjacent to Hill 145. His remains were never recovered from the battlefield. Wendell is commemorated on the Canadian War Memorial, Vimy Ridge, France. Antigonish Cenotaph Project profile. 2. Private William Alfred Rogers, son of William H. and Mary M. (Durant) Rogers, was killed in action on the morning of April 9, 1917, northwest of the village of Thélus, France, while serving with the 26th Battalion (New Brunswick). As with Wendell, William Alfred’s remains were never recovered. His name is also engraved on the Canadian War Memorial, Vimy Ridge, France. Antigonish Cenotaph Project profile. 3. 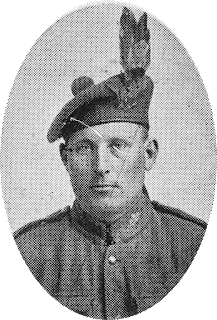 Private John Angus Sheehan, son of Joseph and Mary (MacDonald) Sheehan, Gloucester, MA, and nephew of Alexander MacDonald, Clydesdale, Antigonish County, was killed in action on April 9, 1917, during the 85th Battalion’s successful early evening assault on Hill 145. 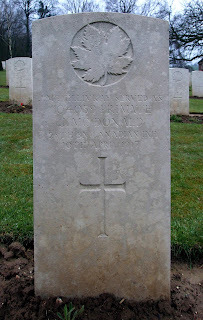 He was laid to rest in nearby Givenchy Road Canadian Cemetery, Neuville-St-Vaast, France. Antigonish Cenotaph Project profile. 4. Private John Angus MacGillivray, son of Alexander and Margaret “Maggie” (Cameron) MacGillivray, Fraser’s Mills, Antigonish County, died on April 10, 1917, from wounds received while serving with the 28th Battalion (Northwestern) in newly captured trenches atop Vimy Ridge. He was laid to rest in Écoivres Military Cemetery, Mount-Saint-Éloi, France. Antigonish Cenotaph Project profile. 5. 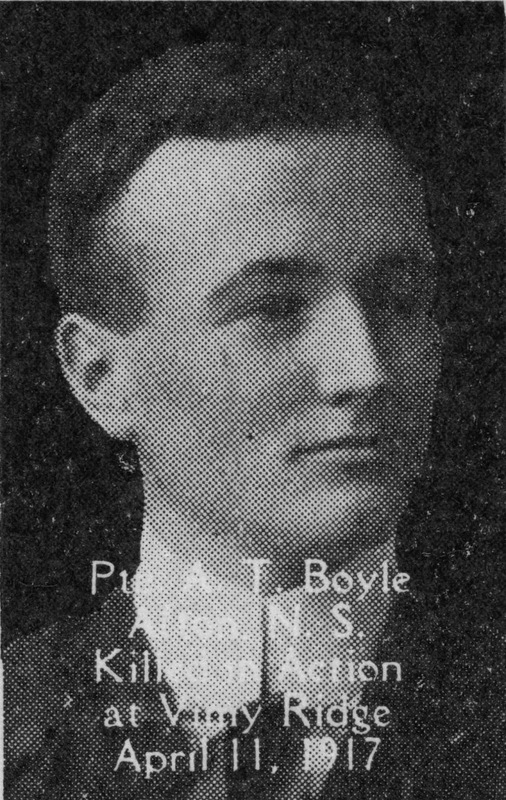 Private Ambrose Thomas Boyle, son of Henry and Margaret (Torpey) Boyle, Afton, Antigonish County, was killed by enemy artillery fire on April 11, 1917, as he and his 47th Battalion (British Columbia) comrades prepared for the following day’s attack on “The Pimple,” an elevated location north of Hill 145. Ambrose was laid to rest in Givenchy Road Canadian Cemetery, Neuville-St-Vaast, France. Antigonish Cenotaph Project profile. 6. 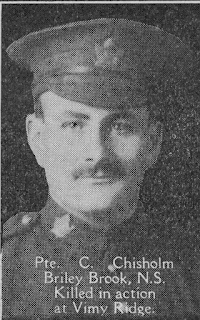 Private Colin Chisholm, son of Donald A. and Margaret (Campbell) Chisholm, Brierly Brook, Antigonish County, was killed in action on April 12, 1917, during the 46th (South Saskatchewan) Battalion’s attack on “The Pimple.” Colin’s remains were never recovered from the battlefield. His name is inscribed on the Canadian War Memorial, Vimy Ridge, France. Antigonish Cenotaph Project profile. 7. 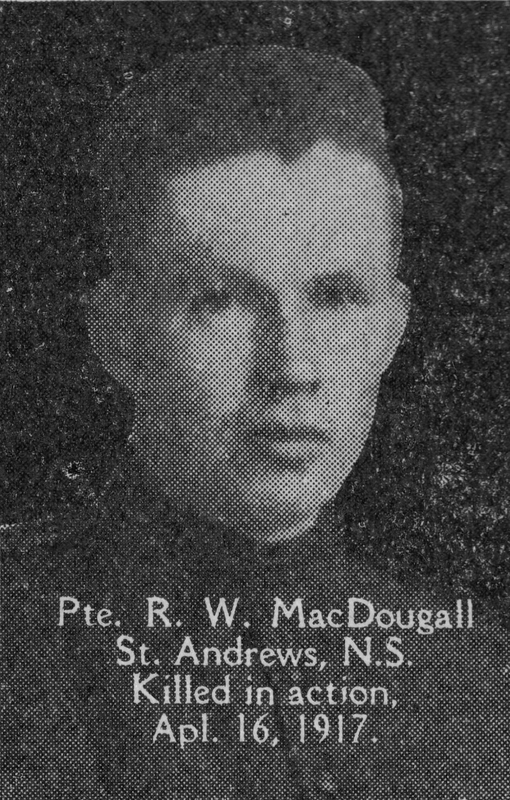 Private Roderick William MacDougall, son of Archibald and Margaret (Chisholm) MacDougall, North Grant, Antigonish County, and nephew of Mary Ann “Maggie” Chisholm, Fraser’s Mills, Antigonish County, was killed in action while serving with the 43rd Battalion (Cameron Highlanders of Canada) in trenches near Vimy Ridge, France. As his remains were never located, Roderick William is commemorated on the Canadian War Memorial, Vimy Ridge, France. Antigonish Cenotaph Project profile. Thomas Leo Dort was born at Canso, NS, on August 4, 1893, the third of Bridget Jane (George) and James A. Dort’s eight children. During the spring of 1916, military recruiters visited the coastal community for the first time, in search of soldiers for the 193rd Battalion, one of four infantry units that formed the Nova Scotia Highland Brigade. Thomas enlisted with the 193rd on April 6, 1916, and spent the summer months training at Camp Aldershot alongside soldiers from the 85th (Nova Scotia Highlanders), 185th (Cape Breton Highlanders) and 219th Battalions. On October 12, 1916, the Highland Brigade’s soldiers departed from Halifax aboard SS Olympic. Following its overseas arrival, two of its units—the 193rd and 219th—were dissolved and their personnel re-assigned to existing battalions. 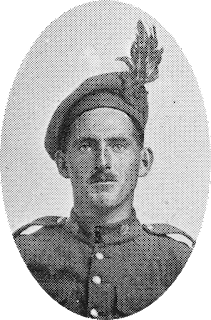 Thomas was part of a reinforcement draft of 193rd soldiers transferred to the 42nd Battalion (Royal Highlanders of Canada) on December 5, 1916. He joined his new unit near Neuville-Saint-Vaast, France, in early January 1917. Thomas served a regular rotation in the line with the 42nd until March 21, when he was admitted to No. 1 Canadian General Hospital, Étaples, for treatment of an “ischio-rectal abscess,” a problem that had plagued him for several years prior to his enlistment. Invalided to England three days later, he underwent surgery and quickly recovered. Transferred to the Canadian Convalescent Hospital, Woodcote Park, Epsom, on April 14, Thomas was discharged from medical care before month’s end and reported to the 20th Reserve Battalion, Shoreham. Re-assigned to the 42nd’s ranks on June 19, Thomas returned to the Canadian Base Depot, Le Havre, France, but did not immediately rejoin his battalion. In early July, he was temporarily attached to the 3rd Entrenching Battalion and worked on a variety of projects near Arras, France, throughout the summer months. When the unit was dissolved in mid-September, Thomas reported to the Canadian Corps Reinforcement Camp, Villers-au-Bois, where he remained throughout the winter of 1917-18. On March 4, 1918, Thomas was assigned to the 2nd Tramway Company, Canadian Engineers, and joined its ranks near Aix-Noulette, France, shortly afterward. One of two units that built, maintained and operated a network of small-gauge railways, its gasoline-powered trains moved ammunition and supplies to “dumps” in the forward area, carried troops into the front lines and transported wounded soldiers to field ambulance stations. The Company’s “sappers” worked in the open, without the benefit of access to trenches or dugouts. As a result, hostile artillery fire posed a consistent threat while the men completed their daily tasks. The unit’s war diary reported a total of 13 “other rank” (OR) casualties during the month of May, a statistic that increased to 78 the following month, when an outbreak of “pyrexia” (trench fever) sent 30 men to field ambulance. When Allied forces launched a major counter-offensive east of Amiens in early August, the tramway companies hauled large quantities of supplies to the front lines and constructed new sections as the advance progressed into German-held territory. Their work continued during a second offensive east of Arras at month’s end, 2nd Tramway reporting its first fatalities since Thomas joined its ranks—one OR killed and a second died of wounds, both the result of enemy artillery fire—during the first week of September. In subsequent weeks, “construction continued with great rapidity” as the tramway units kept pace with the Canadian Corps’ advance toward Cambrai. In mid-September, however, Thomas reported to field ambulance for treatment of a bacterial infection and was evacuated to hospital at Étaples, France. Discharged to convalescent camp in mid-October, he contracted influenza early the following month and spent almost two weeks recuperating. By the time Thomas was discharged from medical care, the November 11, 1918 Armistice had brought fighting to an end. As a result, Thomas crossed the English Channel before year’s end and reported to the Canadian Engineers Training Depot, Seaford. On February 23, 1919, he departed for Canada aboard SS Belgic and landed at Halifax one week later. Thomas was formally discharged from military service on March 24 and returned to Canso, where he resumed work in the local fishery. On January 18, 1920, Thomas married Margaret Baker, a native of Tancook, Lunenburg County, in a ceremony held at Star of the Sea Church, Canso. For several years, Thomas experienced no health issues. By early 1926, however, he was under doctor’s care for treatment of “kidney, lung and heart troubles.” His condition slowly worsened and he passed away at Canso, NS, on April 2, 1926. He was laid to rest in Star of the Sea Parish Cemetery. A note on Thomas’ death certificate stated that he had been “gassed and wounded during the Great War.” While his service record contains no record of specific treatment for either condition, military authorities subsequently agreed that his death was connected to his military service. 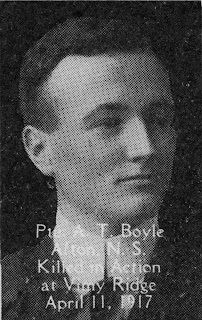 Thomas’ story is one of 64 profiles contained in Bantry Publishing’s First World War Honour Roll of Guysborough County, Nova Scotia, Volume II: 1918 - 1937, available for purchase online at bantrypublishing.ca . Vernon Cecil Horton was born at Roachvale, Guysborough County, on November 16, 1893, the third of Caroline “Carrie” (Nickerson) and Captain Moses Cook Horton’s eight children and the second of the couple’s four sons. 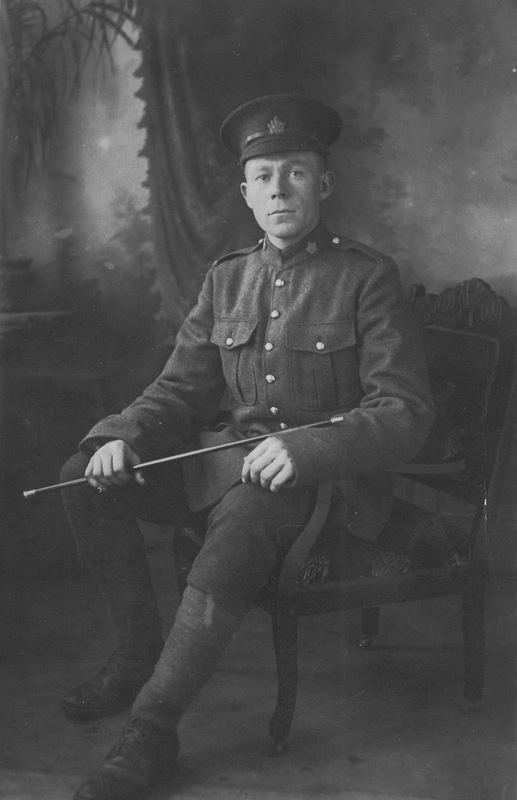 Vernon commenced training with the 106th Battalion (Nova Scotia Rifles) at Truro, NS, on November 10, 1915, and formally attested with the unit one month later. On July 15, 1916, the 106th departed for England aboard SS Empress of Britain. Shortly after his overseas arrival, Vernon was hospitalized for treatment of indigestion and subsequently underwent appendicitis surgery. As the 106th was disbanded during his time in hospital, Vernon was assigned to the 26th Reserve Battalion on January 4, 1917. Six weeks later, he was transferred to the Royal Canadian Regiment (RCR) and proceeded to France. On March 1, Vernon joined the RCR’s ranks near Bruay, France. On the morning of April 9, 1917, the RCR and two of its 7th Brigade mates—the 42nd Battalion (Royal Highlanders of Canada) and Princess Patricia’s Canadian Light Infantry (PPCLI)—participated in the opening stage of the Canadian Corps’ successful attack on Vimy Ridge. Vernon came through his first combat experience without injury and served with the RCR in sectors near Lens, France, throughout the spring and early summer of 1917. While the RCR did not participate in the combat stage of the Canadian Corps’ August 15, 1917 capture of Hill 70, near Lens, the unit entered trenches on the newly captured location one week later. During the ensuing tour, its soldiers were subjected to intense enemy fire, particularly from German artillery. On August 23, Vernon was buried by debris from an exploding shell, and also suffered a wound to his right thigh sometime during the incident. Rescued by comrades, he was immediately transported to a nearby casualty clearing station for treatment. Two days later, Vernon was evacuated to hospital at Étaples, France, and invalided to England at month’s end. 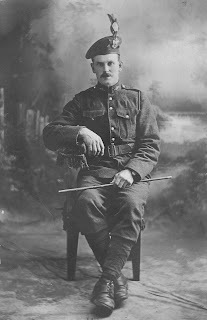 Medical notes indicate that while a foreign object was still embedded in his thigh, it caused “little inconvenience.” Discharged to duty in late November 1917, Vernon was assigned to the 17th Reserve Battalion (Nova Scotia), and commenced a program of musketry training shortly afterward. On April 7, 1918, he qualified as an Instructor and was promoted to the rank of Lance Corporal “while employed as Musket Instructor” at Camp Aldershot. In late July, he advanced to the rank of Corporal. On November 15, military authorities recommended that Vernon be invalided to Canada and discharged as “medically unfit.” One week later, he departed England and arrived at Halifax before month’s end. A second Medical Board convened after his return to Nova Scotia confirmed the occurrence of significant health issues following physical exertion. In response to its findings and recommendations, Corporal Vernon Cecil Horton was discharged from military service as “medically unfit” on December 26, 1918. Vernon immediately returned to the family farm at Roachvale. On February 24, 1920, he married Annie Margaret Dowling, a native of Inverness County, in a ceremony held at Boylston. The couple settled at Roachvale, where they planned to raise a family. Sadly, their first child—a son, Willard Dooley Horton—passed away from bronchial pneumonia on December 27, 1921, at one month of age. One year later, the young couple welcomed a second son, Ralph, while a daughter, Doris, later joined the family. For several years, Vernon experienced no health problems. In the spring of 1926, however, he fell ill and was admitted to St. Martha’s Hospital, Antigonish. On March 31, 1926, Vernon passed away in hospital from a combination of “meningitis [and] probably tuberculosis,” and was laid to rest in Evergreen Cemetery, Guysborough. Three and a half months after Vernon’s passing, military authorities agreed that his death was the “result of service” and approved the provision of an Imperial War Graves Commission headstone for his final resting place. Vernon’s story is one of 64 profiles contained in Bantry Publishing’s First World War Honour Roll of Guysborough County, Nova Scotia, Volume II: 1918 - 1937, available for purchase online at bantrypublishing.ca . Stephen Toney was of Mi’kmaq ancestry, “born in a boat two miles off Little Harbour, [Pictou County, Nova Scotia,] while his parents”—Noel and Sarah Toney—“were on a voyage from Merigomish to Indian Cove.” There is considerable discussion as to Stephen’s birthdate. According to his attestation papers, he was born on July 26, 1877. The 1881 Canadian census, however, stated that he was five years old at the time its data was collected (April 1881), suggesting that he was born in 1875 or 1876. A medical document in his service file, completed prior to his discharge, claims that Stephen was born in 1872, but no available sources support this assertion. On March 29, 1916, Stephen enlisted with the 193rd Battalion at Pictou, NS. At the the time, he was married with at least one son, Noel, born in April 1902. Stephen listed his occupation as “cooper”—a common trade among Mi’kmaq men—and claimed to be 38 years and nine months of age at the time. A contemporary source later claimed that 12 Pictou County Mi’kmaq men served overseas with various Canadian military units during the First World War. One of four infantry battalions that formed the Nova Scotia Highland Brigade, the 193rd recruited its personnel across northern Nova Scotia. In late May, the Brigade’s soldiers gathered at Camp Aldershot, near Kentville, NS, where they spent the summer months in training. On October 12, 1916, the four battalions departed for England aboard SS Olympic. Shortly after arriving overseas, two Brigade units—the 193rd and 219th Battalions—were dissolved and their personnel dispersed to other units. Stephen was part of a draft of 193rd soldiers assigned to the 42nd Battalion (Royal Highlanders of Canada) on December 6, 1916. While he immediately proceeded to France, he served for a brief period with the 3rd Entrenching Battalion before reporting to the 42nd’s camp on January 2, 1917. One month later, the 85th Battalion (Nova Scotia Highlanders)—the Highland Brigade’s senior unit—crossed the English Channel to France and commenced service in the forward area with the 4th Division. On February 24, 1917, Stephen received a transfer to the 85th and joined its ranks early the following month. While eager to return to the trenches, Stephen spent another two months in England before rejoining the 85th’s ranks in late November 1917. Throughout the winter months, he served a regular rotation in the line. As time passed, however, health issues connected to his gas exposure surfaced. On February 15, 1918, he reported to No. 11 Field Ambulance for treatment of “chronic bronchitis.” Transported by ambulance train to No. 7 Canadian General Hospital, Étaples, two days later, Stephen was invalided to England for a second time early the following month. On March 6, Stephen was admitted to Birmingham War Hospital, Rednal, Birmingham, where he was diagnosed with “debility.” At month’s end, he received a transfer to the Epsom convalescent facility and was discharged from care on April 4. As medical authorities determined that there was “no disability,” Stephen was classified as “Fit D1”—fit for duty upon completion of remedial training. After completing a 12-day pass, he reported to the 2nd Canadian Corps Depot, Bramshott. On December 25, 1918, Pte. Stephen Toney was formally discharged from military service and rejoined his wife Annie, who had taken up residence at Upper Musquodoboit, NS, during his absence. At some point following his homecoming, Stephen travelled to New Glasgow, NS, where Mayor H. G. Grant and a group of town representatives presented three recently returned Pictou County Mi’kmaq “soldier boys”—Stephen, Noel Francis and Teddy Knockwood—with a Scroll of Honour. According to the 1921 Canadian census, Stephen and Annie Toney were residing on a Mi’kmaq reserve at Musquodoboit, Halifax County, their dwelling’s only occupants. Stephen’s occupation at the time was listed as “trapper.” No additional information is available on his subsequent life. A note in Stephen’s military file states that he passed away at an unspecified location on August 11, 1943. 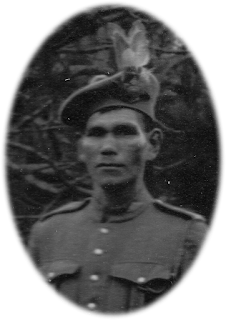 Lewis Seaboyer Bezanson was born at Goldboro, Guysborough County, on March 4, 1897, the younger of Charity Hope (Giffin) and Obediah “Obed” Bezanson’s two children. Lewis’s older sibling, Vivian Hope, died at the Victoria General Hospital, Halifax, on September 17, 1913, from the effects of a perforated ulcer. She was 19 years old at the time of her passing. Three years later, Lewis enrolled in Acadia University’s Bachelor of Arts program. He had just completed his sophomore year of studies when he was conscripted into military service at Camp Aldershot, NS, on May 23, 1918. Upon completing his basic training, Lewis departed for England on August 2 and reported to Camp Bramshott, where he joined the ranks of the 17th Reserve Battalion (Nova Scotia). His overseas arrival coincided with the commencement of a major Allied counter-offensive at Amiens, France, only days later. The campaign led to the signing of the November 11, 1918 Armistice, an event that ended any opportunity to serve at the front for the vast majority of conscripts. Lewis remained in England throughout the winter of 1918-19. On March 3, 1919, he was assigned to the Khaki College’s central campus, Ripon, Yorkshire. A joint project of the Canadian YMCA and Chaplaincy services, the College boasted a faculty of more than 70 lecturers and offered courses at virtually all educational levels. While details of Lewis’s role at the College are unknown, given his pre-service role as a student, he most likely participated in on of its programs. 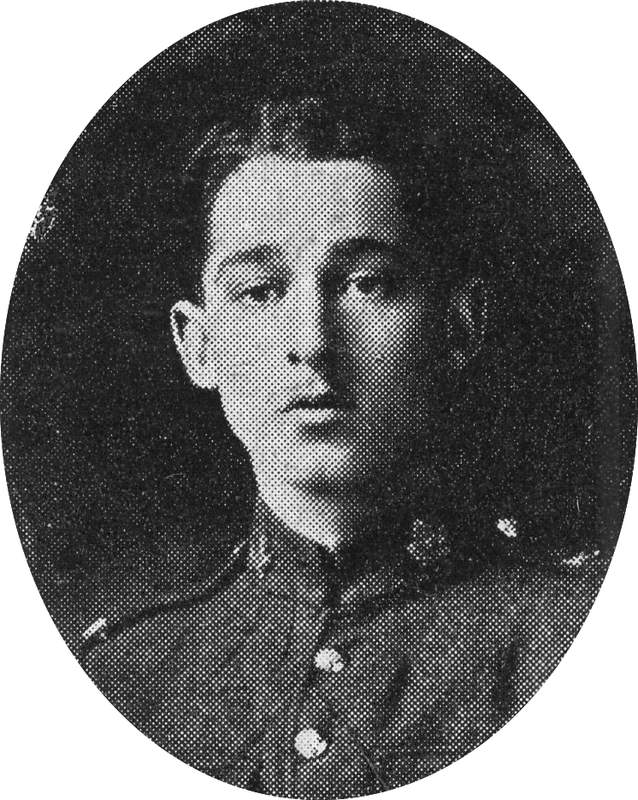 Lewis remained at Khaki College until May 26, when he returned to the Canadian Corps Depot, Ripon, Six weeks later, he departed for Canada aboard HMTS Winfredian and arrived at Halifax on July 28. Five days later, Lewis was officially discharged from military service and returned home to Goldboro. Several weeks later, he returned to Acadia University and resumed his program of studies. Sometime during the 1919-20 academic year, Lewis was diagnosed with pulmonary tuberculosis and admitted to Kentville Sanatorium. For almost one year, he remained under the institution’s care. His health slowly worsening, Lewis returned to his Goldboro home in late February 1921. Dr. John James “J. J.” McRitchie, the area’s family physician and a former medical officer, oversaw his care. Private Lewis Seaboyer Bezanson passed away at home at 2:00 a.m. March 16, 1921. Dr. McRitchie identified the cause of death to “tuberculosis, pulmonary” contracted “during war service overseas.” Military officials subsequently concurred with his assessment and offered to provide an Imperial War Graves headstone for Lewis’s final resting place in Bayview Cemetery, Goldboro. His parents, Obed and Charity, declined the offer and erected a private memorial at his gravesite. Lewis’s story is one of 64 profiles contained in Bantry Publishing’s First World War Honour Roll of Guysborough County, Nova Scotia, Volume II: 1918 - 1937, available for purchase online at bantrypublishing.ca . John Rood Dickson was born at Sonora, Guysborough County, on December 7, 1891, the youngest of Druscilla (Hewitt) and John Dickson’s 10 children. 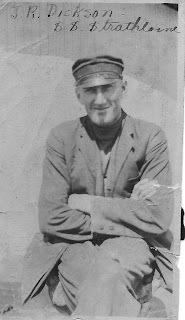 Born into a family with a seafaring tradition, young John found employment on the SS Strathlorne, a coastal steamer that operated out of Halifax, NS and travelled along the Halifax and Guysborough County coastline. Following the outbreak of war in Europe, the capital city and its port bustled with military activity. It was not long before John was enticed into uniform, enlisting with the 64th Battalion (Maritime Provinces) at Sussex, NB, on August 20, 1915. The unit crossed the North Atlantic in early April 1916 but was disbanded within three months of setting foot in England. Prior to its dissolution, its ranks provided several reinforcement drafts for units in the field. On June 28, 1916, John was part of a group of soldiers assigned to the 25th Battalion (Nova Scotia Rifles). He immediately crossed the English Channel and reported to the 25th’s camp at Heksken, Belgium, one month later. In early September 1916, the new arrivals travelled to the Somme region of France with their new unit and participated in the Canadian Corps’ successful September 15, 1916 attack on the village of Courcelette. The following day, German artillery heavily shelled the 25th’s position. During the bombardment, John suffered shrapnel wounds to his chin and back, and was evacuated for medical treatment. The injuries proved minor and John rejoined the 25th’s ranks early the following month. He served with the unit in sectors near Vimy Ridge, France, throughout the winter of 1916-17 and participated in the Canadian Corps’ successful April 9, 1917 attack on Vimy Ridge. In subsequent months, John saw combat at Hill 70, near Lens, in mid-August 1917. Hospitalized for treatment of an infection in late September 1917, he remained under medical care for two months, thus missing the 25th’s combat tour at Passchendaele, Belgium. Following his discharge from hospital, John remained at the Canadian Corps Reinforcement Centre for several months before finally returning to the 25th’s ranks near Amiens, France, on August 15, 1918. At the time of John’s return, his 25th comrades were still “in the line,” having recently participated in a major Allied counter-attack on the German line east of Amiens. The battle marked the beginning of Canada’s “100 Days,” a series of engagements that were part of a larger Allied offensive that led to the cessation of hostilities. Before month’s end, the 25th participated in a second attack east of Arras, France. Following a brief period of rest and training, the 25th completed a series of challenging tours near Inchy-en-Artois during the third week of September. While the unit did not participate in the Canadian Corps’ attack on Canal du Nord, west of Cambrai, in late September, its soldiers followed retreating German forces northward toward the Belgian frontier during the subsequent weeks. On the afternoon of November 6, 1918, John and his mates returned to front line duty and led an advance across the Belgian frontier on the following day. The action proved to be the 25th’s last combat assignment of the war as the November 11, 1918 Armistice brought fighting to an end. One week later, the unit set out on foot for Bonn, Germany, as part of the “army of occupation” accepted by Germany as part of the ceasefire’s terms. The 25th’s soldiers crossed the German border on December 3, 1918, and eight days later reached their destination. The unit remained in quarters at Bonn until January 22, 1919, at which time personnel boarded a train and departed for Belgium. The following day, its personnel entered billets at Auvelais, east of Charleroi, Belgium. On February 3, 1919, John reported to No. 20 Casualty Clearing Station, Charleroi, for treatment of bronchial pneumonia. While initially reported as “dangerously ill,” John appeared to recover after a week under care. By February 20, however, his condition worsened and his name was once again placed on the “dangerously ill” list. Private John Rood Dickson lingered for six days before passing away from bronchial pneumonia on February 26, 1919. He was laid to rest in Charleroi Communal Cemetery, Charleroi, Belgium. John’s story is one of 64 profiles contained in Bantry Publishing’s First World War Honour Roll of Guysborough County, Nova Scotia, Volume II: 1918 - 1937, available for purchase online at bantrypublishing.ca . Perry Judson Giffen was born at Goldboro, Guysborough County, on June 21, 1895, the sixth of Theodosia (Bezanson) and Obed Chute Giffen’s seven sons. Sometime before 1911, the family relocated to Halifax, where Perry attended Halifax Grammar School and Halifax County Academy. During his time at the two institutions, he developed an interest in journalism and also served with the Halifax Academy Corps, a cadet militia unit. On March 14, 1916, Perry enlisted with the 219th Battalion at Halifax, NS. One of four infantry units that constituted the Nova Scotia Highland Brigade, the 219th spent the summer months at Camp Aldershot, training alongside its three Brigade mates—the 85th (Nova Scotia Highlanders), 185th (Cape Breton Highlanders) and 193rd Battalions. On August 4, Perry was promoted to the rank of Sergeant. The Highland Brigade departed for England on October 12, 1916, and arrived at Liverpool, England, six days later. Significant casualties incurred during the Canadian Corps’ autumn 1916 service at the Somme resulted in military authorities dissolving two Brigade units—the 193rd and 219th Battalions—before year’s end. As a result, Perry was transferred to the 26th Battalion (New Brunswick) on January 13, 1917. The 26th reported light casualties during the assault and served regular rotations in sectors near Lens throughout the spring and early summer of 1917. At 4:25 a.m. August 15, 1917, the battalion advanced in support positions during the opening stage of the Canadian Corps’ attack on Hill 70, near Lens. Later in the morning, its soldiers passed through their Brigade comrades’ lines and pressed onward toward Norman Trench, the day’s final objective. Sgt. Perry Giffen was one of the first day’s casualties, a piece of shrapnel from an artillery shell striking the front of his right shoulder and exiting below his scapula [shoulder blade]. He remained on the battlefield for almost two days as artillery fire and German counter-attacks made it impossible for stretcher bearers fo evacuate the wounded. On August 19, Percy was finally admitted to No. 23 Casualty Clearing Station, where staff cleaned and dressed his wound. He was then evacuated by ambulance train to No. 4 General Hospital, Camiers, France. A subsequent medical examination determined that Perry had suffered a compound fracture at the head of his humerus [upper arm bone] and scapula. After two surgeries and a lengthy recovery period, Perry was invalided to England in late September and admitted to 2nd General Hospital, Moston, Manchester. Following Perry’s transfer to the Canadian Convalescent Home, Bearwood Park, Wokingham, on November 23, staff began a rigorous program of physical therapy designed to restore his shoulder, arm and hand movement. As his injuries eliminated any possibility of returning to France, Perry was transferred to No. 5 Canadian General Hospital, Kirkdale, Liverpool, in early February 1918, the first step on the journey home. During his time under medical care, Perry met Kathleen Mailing, a native of Oxford, England. On March 2, military authorities granted Perry “permission to marry” and the couple were wed shortly afterward. Before month’s end, Perry departed from Liverpool, England, aboard HS Llandovery Castle and arrived at Halifax, NS, on April 9. His bride followed him to Canada shortly afterward. On October 5, 1918, Perry was officially discharged from military service at Halifax. His time in uniform, however, was not over. Perry immediately enlisted with the Royal Canadian Navy’s Intelligence Staff and served with its Halifax office until late May 1919, at which time he was admitted to local hospital with appendicitis. Following surgery and recovery, Perry was discharged from the Navy on June 25, 1919. Upon returning to civilian life, Perry briefly worked as a “confectioner” before joining the staff of the Halifax Herald. He and Kathleen welcomed their first child—Perry James—in 1920. A daughter, Betty, joined the family several years later. While Perry initially worked as a journalist, he soon moved into the newspaper’s advertising department, where he found “his life’s work.” He quickly rose to the position of advertising manager and assistant business manager with the Herald. Employment opportunities subsequently took Perry and his family to Hamilton and Toronto. In 1928, he joined the Southam News organization and accepted a position as business manager of the Edmonton Journal. The following year, Perry was elected one of Southam’s directors. The Giffens returned to Ontario in 1935, when Perry accepted a position as managing editor of the Peterborough Examiner. The following summer, he found time to return to Nova Scotia to visit family. While his war wound limited his right arm’s mobility and caused occasional discomfort, no major problems occurred until several months after the family relocated to Peterborough. Hospitalized for two months for treatment of an infection in his wounded shoulder, Perry appeared to make a complete recovery. In early February 1937, however, he once again fell ill and was admitted to Nicholls Hospital, Peterborough, on February 12. By that time, Perry had developed “caries”—significant bone decay—in his right shoulder, a condition that produced multiple abscesses and resulted in septicaemia. Six days after his admission, doctors performed surgery, removing large pockets of pus at both the shoulder and elbow joints. Despite the surgical intervention, Sgt. Perry Judson Giffen died in hospital from complications attributed to his First World War injury on February 19, 1937. He was laid to rest in Little Lake Cemetery, Peterborough, ON. Military authorities subsequently confirmed that Perry’s death was “due to military service” and approved the provision of a Commonwealth War Graves Commission headstone for his final resting place. Perry’s story is one of 64 profiles contained in Bantry Publishing’s First World War Honour Roll of Guysborough County, Nova Scotia, Volume II: 1918 - 1937, available for purchase online at bantrypublishing.ca .